Attempting to regroup as their challenging pursuit resumes, the partners in crime are forced to acknowledge the odds might be stacked against them in ways more mysterious than either one anticipated. Can they trust each other to enact a more effective plan before it’s too late? We invite you to pair the exciting new issue of C-U Confidential – vintage 2015, bottled 2017 – with your favorite libation or other pick-you-up as the summer sets in! Keep a private (or public) eye on our Facebook page for reports from Confidential Agents as they disseminate our literature beginning on or after this Friday, May 12, for your FREE investigative pleasure! Deep in the recesses of a local watering hole, our gallant gumshoe Eric Sizemore and resourceful informant Drea Abbas trade verbal notes only to find they have fumbled the ball and relinquished a lead most vital to their efforts. 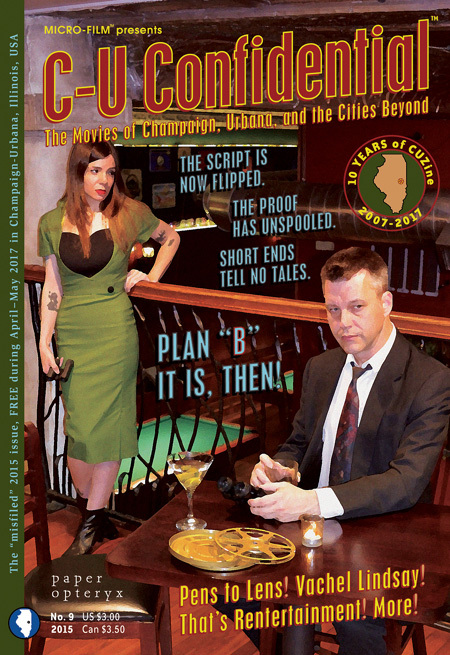 CUZine does its best to not leave you in the lurch like our discouraged duo, revealing everything it can about the cinema arts in Champaign, Urbana, and the cities beyond! With the script selection and production process in full swing for 2017, Ye Ed visits with several adult participants to reflect on last year’s Pens to Lens Screenwriting Competition + Gala as well as hint at what is in store for this student-centered program during the warmer months. He also double dips with anecdotes about the place of That’s Rentertainment in our lives and why its closure changes how the citizens du C-U might consume and communicate about the movies. Moving from future fears to the past tense, Springfield poet and performer Vachel Lindsay defined the kind of movie writing we consume and use to communicate with to this day in his landmark 1915 book, The Art of the Moving Picture; we share excerpts from it and ponder Lindsay’s place in the contemporary consciousness. Mr. JaPan then encourages our populace to actively reach outside their viewing comfort zone to discover films and film-going experiences both unique and challenging, while Jenny Southlynn conveys thoughts on Lindsay and fellow brilliant mind David Foster Wallace. Related summations of area activity fill out issue 9, of course! Having now returned to our annual release pattern for C-U Confidential, even though we missed out on Roger Ebert’s Film Festival by necessity due to your humble editor’s family needs, we look forward to pushing our frequency to twice-a-year beginning this fall. Frankly, the current installment was a big pain to complete and get funded, but we’re suitably relieved to break on through to the other side with something tangible as a treat for loyal readers in our 10th anniversary year. Please shake the hands of our friends at Bachelor Pad Magazine, Barham Benefit Group, Cellar Dweller Films, Champaign Movie Makers, Cinema Gallery, C-U Adventures in Time and Space, Dreamscape Cinema, Elliott Counseling Group, Go Retro!, Harvest Moon Twin Drive-In, Heirship Records, Hobnobben Film Festival, Pens to Lens/C-U Film Society, Premier Print Group, R.A.Z. Films, Vachel Lindsay Association, and WEFT 90.1 FM for providing us with the advertising coverage necessary to kick out this issue. In addition, we ask you to raise a glass – martini or not, shaken or stirred – to the handful of generous and anonymous donors whose contributions helped us fulfill our budget goals. We thank you all, with honors! This entry was posted on Friday, May 12th, 2017 at 1:00 pm	and is filed under C-U Confidential, Print Matter du C-U. You can follow any responses to this entry through the RSS 2.0 feed. Both comments and pings are currently closed.